Dr. Heck and his team members will be posting, tweeting, and blogging via Facebook, Twitter, and more during the 2012-13 Antarctica expedition. Check out the links below to keep up on the latest! 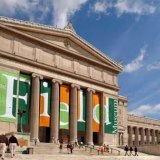 Field Museum Facebook Page: Follow along with us for weekly progress reports on Antarctica and notifications of new blogs from Dr. Philipp Heck. Field Museum Twitter Feed: Don't miss the latest discoveries as Dr. Heck tweets from Antarctica. Robert A. Pritzker Center Facebook Page: Get the latest news on the Antartica expedition, meteorites at The Field Museum, and other buzzworthy topics. Dr. Dale Andersen Twitter Feed: The stromatolite-hunting team left early for Lake Untersee, so find out what they've discoverd since their arrival in mid-November.